NKG2D is a target that is widely expressed in solid and hematologic malignancies but either absent or poorly expressed in normal healthy cells; therefore, NKG2D-targeting CAR T-cells have the potential for broad application. This study infused 12 patients (7 with AML) with a single dose of NKG2D-CAR T cells without lymphodepleting conditioning. No infusional toxicity, cytokine release syndrome, severe autoimmunity, CAR T cell-related encephalopathy syndrome, or death occurred. However, 120 adverse events were reported including 15% at grade 3 and 7% at grade 4. None of the grade 3 events were attributed to the T cell infusion. No dose-limiting toxicities occurred. No objective clinical responses were seen and all patients went on to receive subsequent therapy. The median overall survival was 4.7 months with a survival rate of 75% at 3 months and 42% at 6 months. Three patients were able to achieve stable disease for longer than 1 year with subsequent therapies. NKG2D CAR T cells were detected in 4 patients in peripheral blood, but were not detected in any patient using bone marrow. 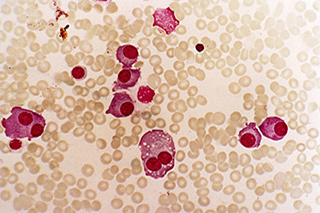 One patient with AML had transient improvements in hematologic parameters at the highest dose. “We demonstrated safety without identifying a maximum tolerated dose at cell doses ranging 1×106 to 3×107, when administered as a single infusion without prior lymphodepleting therapy and showed feasibility of manufacturing and administration without cryopreservation,” the researchers wrote. Editor’s note: The title of this article has been updated to more accurately reflect the findings from the trial.